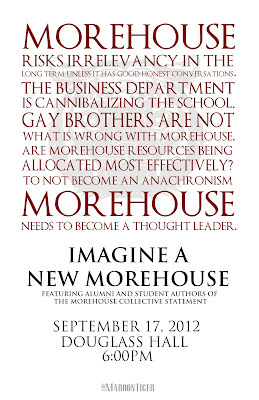 Well if I had still been a student at Morehouse I probably could make this event on campus. Of course there are others who have responded to this drive for the college to be a "Thought Leader". I will have to support this in spirit, even if Imar Hutchins wrote a comment in one of my Morehouse posts encouraging me to attend. If you're on FB, then you can certainly RSVP if you would like to attend.